At Christmas, in a sudden, violent lurch, Peter Capaldi’s face became the Doctor’s. His announcement in the role pleased critics and excited fans as David Tennant’s had in 2005, fresh off the smash-hit set of Casanova – both actors, loved by the public as it was, were hotly tipped for the part. Capaldi, pictured last month in his incarnation’s costume, was by all means a great choice, but I couldn’t avoid mild disappointment. I didn’t want another David Tennant. 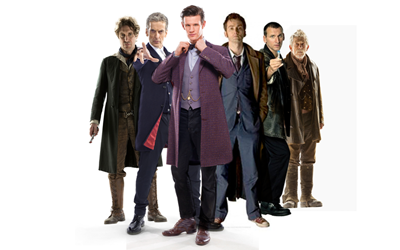 I wanted a Matt Smith. ‘Who’s he?’, family members asked indignantly when Smith’s casting went public. Headlines were similar. However the Doctor looked, he didn’t look like that. The Doctor’s face was famous – it had eyebrows, not a six inch quiff or polystyrene-block chin. And he didn’t wear turnups, hipster tweed or dicky bows. Whovians winced when on-set photos first emerged, Smith hands-behind-back in dad jacket and charity shop shirt. Where now the gravitas and style of Tennant’s greatcoat, his pinstripe suit’s effortless chic? 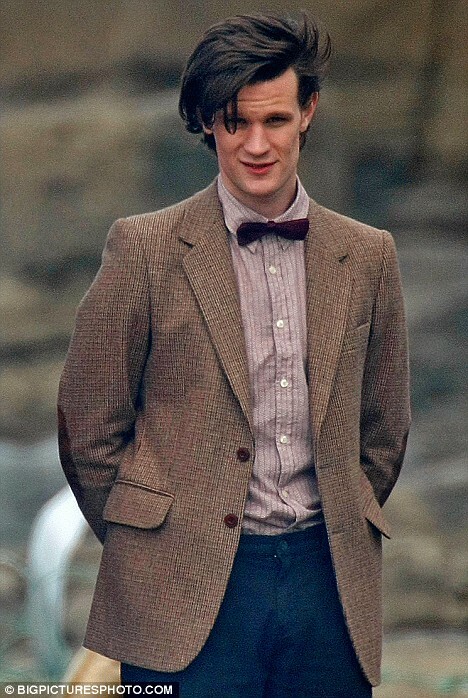 Then ‘The Eleventh Hour’ aired in 2010. Bow ties were cool, the new lead said… and suddenly, near magically, they were. Tennant’s Doctor owed his popularity to populism, handsome, charming and more human than Christopher Eccleston’s had been. Pundits urged his casting when they sensed he’d play a version people liked – like Jon Pertwee’s and Peter Davison’s, Ten was dashing, spry and classically heroic, the handsome head boy with top grades and track prizes. Of all the Doctors, he could most easily be from a different franchise, Buffy or Harry Potter say; at Hogwarts he’d have been a Gryffindor. Russell T Davies envisioned a mainstream, commercial Who, primetime hit rather than fan indulgence, which meant a mainstream and commercial hero. Ten’s character, like his costume, was pitched to be crowdpleasing, a matey, likeable leading man giving noughties viewers what they wanted. They fell for him, and so did his companions. Smith’s Doctor was, by contrast, weird. He ate fish custard, danced terribly and couldn’t say no to a fez, looked twelve but acted eighty, moralised then all but murdered. In costume, character and casting, he was leftfield where his predecessor was a shoe-in TV lead – less instantly accessible a take, but finished all the more impressively for it. Tennant, though a formidable actor, played a character fangirls and -boys would always have swooned over – he never had to work that hard for their affection. That Smith’s Doctor, like his bow tie, was a harder sell is what makes his success remarkable, the product of a singular, tirelessly layered performance. In his fair and relevant critique of Steven Moffat’s writing, ‘The Captain Kirk Problem: How Doctor Who Betrayed Matt Smith’, Ted B. Kissell attacks this incarnation’s habits of ‘telling people how awesome he is’ and scheming deviously, damning Eleven as ‘a swaggering bully – who also withholds vital information from the people about whom he supposedly cares’. This was what made him work. Deceiving Martha was the most manipulative Ten ever got, but Smith’s Doctor (as River Song was fond of pointing out) lied constantly and to everyone – Amy, Rory and Clara for a start. The Doctor’s more interesting when he’s less of a white knight, but more than that, it’s what made this one’s playful whimsy meaningful. Eleven indulged his eccentricities to hide his heart of darkness. His childish side mattered because often, it was a front. Who’d never had such an intricately woven lead. It may not again. Yes, Ten went off the rails in ‘The Waters of Mars’ (2009), but only because hubris was the obvious flaw to script such an unreconstructed hero. Tennant is a script-led actor, hence his success in Shakespeare, but one always sensed Smith, who studied Creative Writing and devised his character by making up short stories, knew more about him than anyone. His Doctor was seldom if ever obvious – instead of giving viewers what we wanted, he gave us what we’d never seen before, then made us fall in love with it.